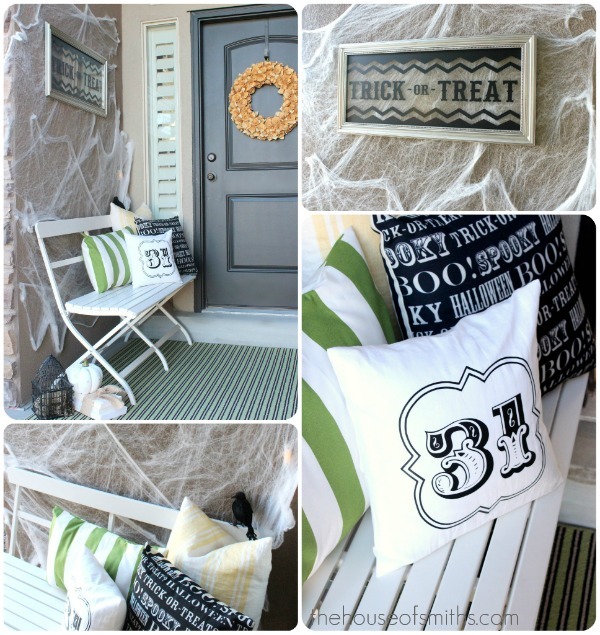 Two years ago we dressed up our porch for Halloween for the first time, and I loved it! Our little covered entryway to our front door is quite small, so there's not a lot of room to work with, but even a little decor can go a long way. 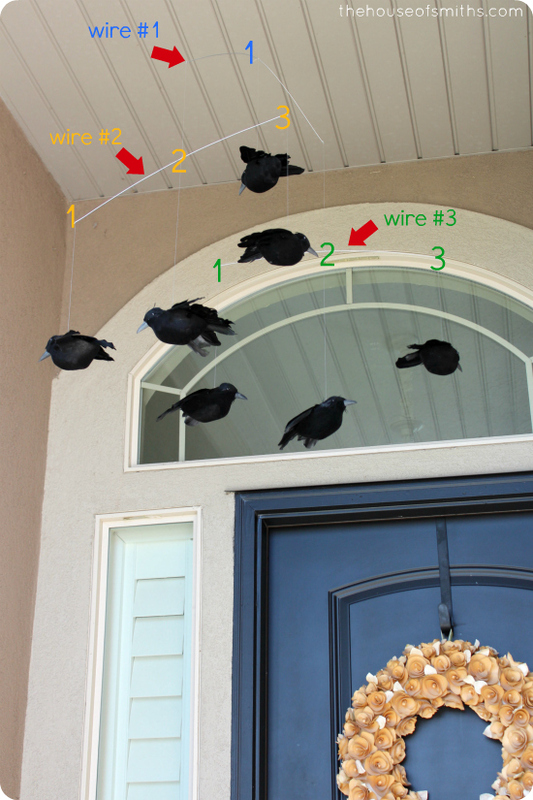 This year, since we had some "flying crows" going on inside the house, I thought it would be cool to have a slew of them circling around the outside as well. I originally got the inspiration when I visited my friend Jamie, who had a Pottery Barn version of this crow mobile hanging over her kitchen sink, that she had purchased a couple of years back. It's no longer available for sale, but I found a source online that listed the PB mobile at around $40. I really wanted one of my own, so I attempted a knockoff version, and in only about 20 minutes and for $14 bucks, I think it turned out pretty dang close! First, you'll need some simple supplies to complete the project; those are listed and shown below. 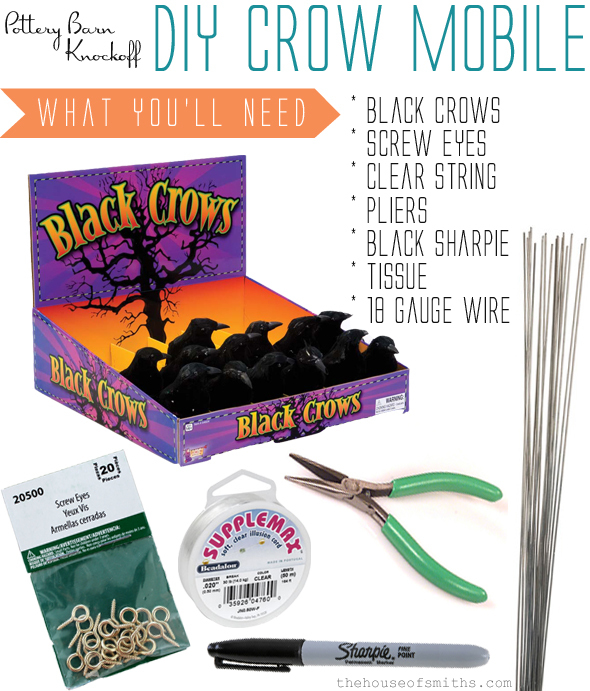 NOTE: The wire is usually found in the floral department, the clear string typically near the jewelry and crows can be bought at your local dollar store! 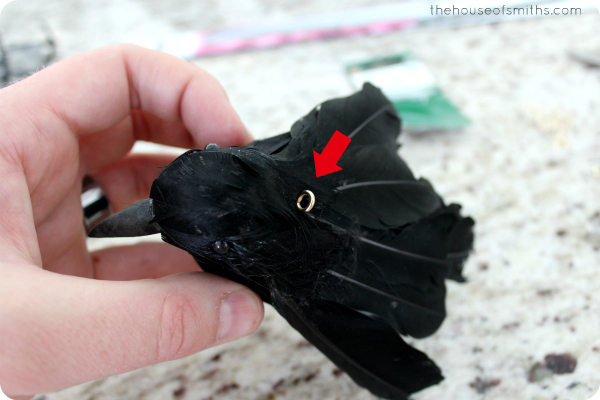 First, if your crows have feet attached to the bottom of them, you'll want to remove those. They'll come out really easily. Then you'll simply roll up some tissue paper and stuff it inside the little holes, to fill in the empty spots and hide the white foam inside (a bit strange, I know... but it works!). Then with a black marker, color over the tissue so it matches the rest of the bird. Basically you're just camouflaging the holes. 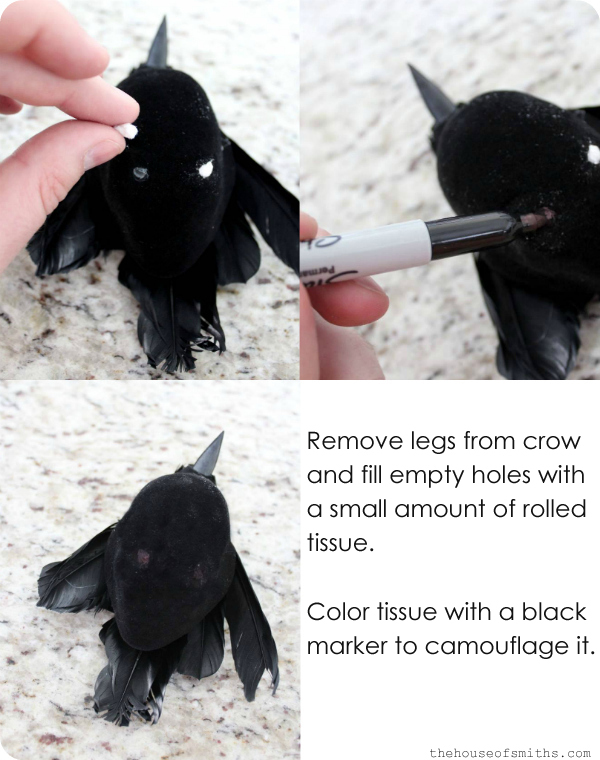 You could also skip the marker step and just use a bit of black tissue paper (like the kind you wrap presents with), but we didn't have any. Next, you'll take a tiny screw eye and twist it into the top of your bird. It should go in quite easily, since they are typically just Styrofoam inside. 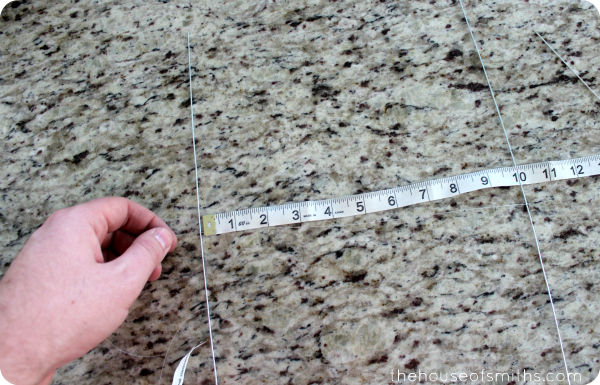 Then measure out how long you want each wire to be for your birds to hang from. Our wires came at 20 inches, so we just kept them that long, and then measured about 10 inches for the string to be between them, but you can adjust this to whatever looks good to you. 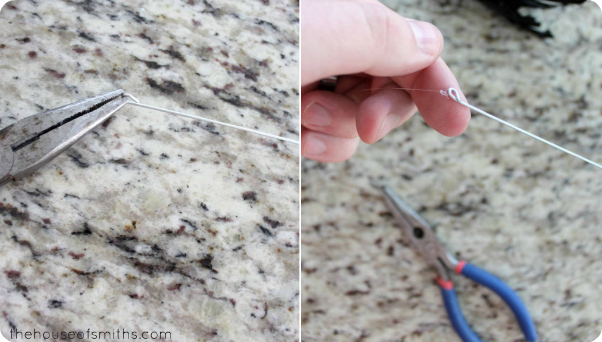 All you have to do to secure the string to the wire, is loop the end with some pliers and then tie the string in a double knot at the ends. Easy as that! Again, you can do whatever formation looks the best to you, and even build up this mobile as big as you want, but here's what we did. Wire #1 (blue) has everything hanging off of it, and one bird dangling from the middle. Then wire #2 (yellow) is attached to the end of #1 with only about 6 inches of wire. It has three birds hanging from it at different lengths. Then lastly, wire #3 (green) is attached to the other side of wire #1, with about 10 inches of string and again, three birds with varying lengths. The mobile is strung up by a clear command hook on the ceiling of the porch. We've been through a few windy storms and this whole setup has held up GREAT! 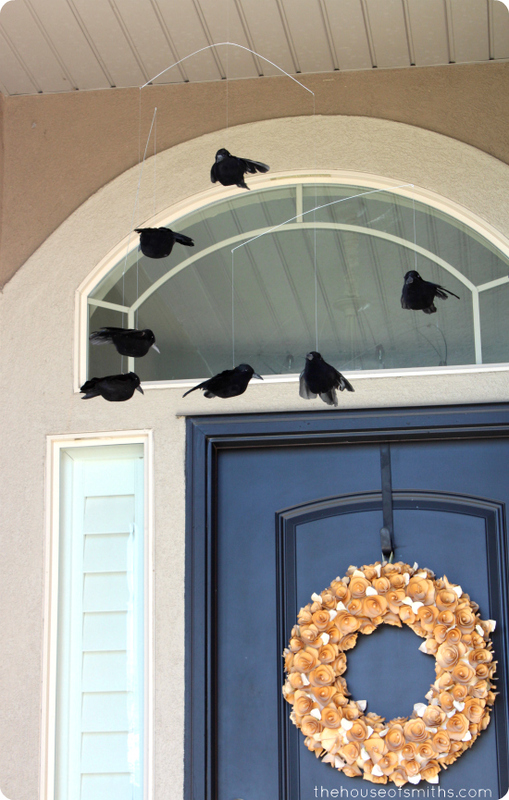 I love the look that these somewhat creepy, "flying" crows give off to visitors, and enjoy it even more knowing that I saved over $25! 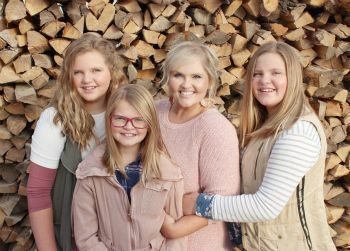 linking up over at Home Stories A to Z! This is awesome!!! I have that same wreath on my front door for most of the year too! 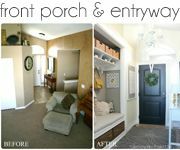 Did you paint the wreath holder to match your door? Genius! This turned out awesome! I love a good knock off. OK seriously, who knew there was a "black crow" box at stores? Sometimes it amazes me the things that I easily find! Then sometimes when I am looking for something that I believe will be a breeze, it takes months. Go figure. That turned out great! I love Pottery Barn, however, I mostly just window shop and dream. Too expensive! I really like this mobile, and it looks great on your porch, but it's a little too much Alfred Hitchcock for me. I actually think the "Alfred Hitchcock" feel is what I love about it! haha. I love that there are no "rules" during the holidays. Anything goes! Shelley, I would have never known that the one you made was a knock off. I mean really, why pay full price for something when you can make it yourself and have it look just as good. Great job. Thanks for sharing. I wish I had more time and patience for knockoff projects, because you're right, they DO pay off! So much fun! Thanks for the post! You did such a great job, bravo. I love it when I see people make things they saw and were expensive. Your mobile looks fantastic. Happy days. 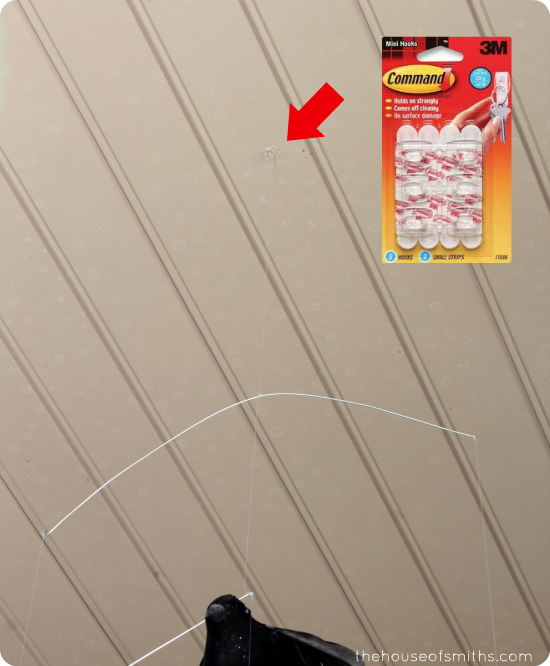 Is the clear string like fishing line or is it thicker? Love this! Yup! It's pretty much the same thing. It comes in different thicknesses. Great idea! 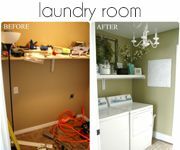 I was admiring the mobile hanging over Jamie's sink too, but I love your thrifty version! Hey Shelley! I just wanted to stop by and say 1.) 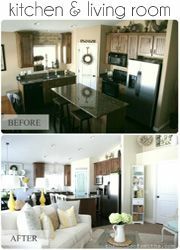 I love your blog and decor style!! I aspire!! And, 2.) 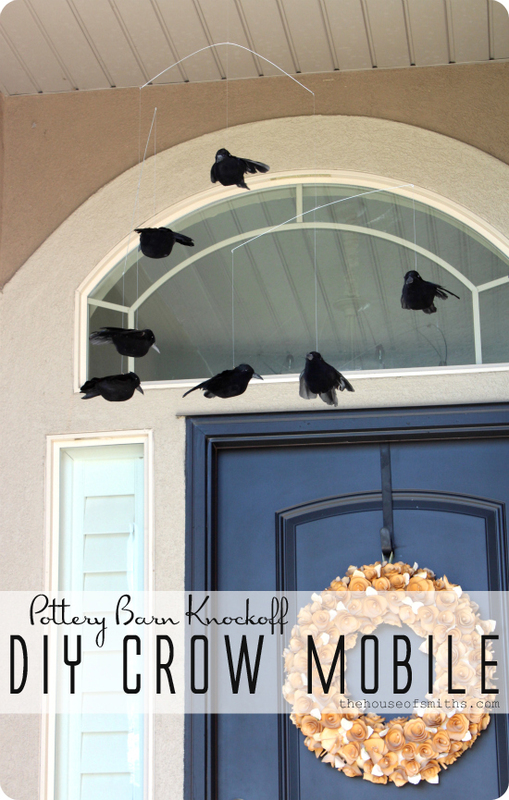 I mentioned your DIY crow mobile in a post I wrote today! 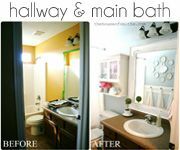 I'd love it if you wanted to stop by and take a peek! Happy Friday!